• Before stringing lights, carefully check them for cracked cords, frayed ends or loose connections. • Keep your Christmas tree well-watered. The combination of shorts in electrical lights and a tinder-dry tree can be deadly. • Throw away old strands of lights for newer, safer lights. • Water and debris can get into outdoor sockets. Make sure outdoor lights are plugged into a ground fault circuit interrupter outlet to reduce the risk of shorts and shocks. • Extension cords occasionally overheat, so touch-test the cord. If it’s hot, unplug it. 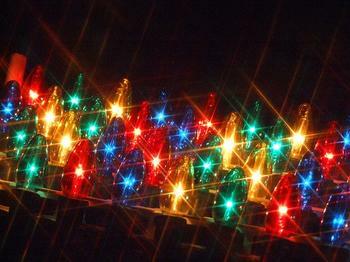 • When hanging lights, don’t use tacks, nails or screws, which can pierce the cable and become electrified. Use insulated hooks instead. • Not all lights are rated for outdoor use. Indoor lights often have thinner insulation, which can become cracked and damaged when exposed to the elements outdoors. So make sure the ones you string up on the house belong out there. • Turn off Christmas lights when you go to bed at night or when you leave the house.